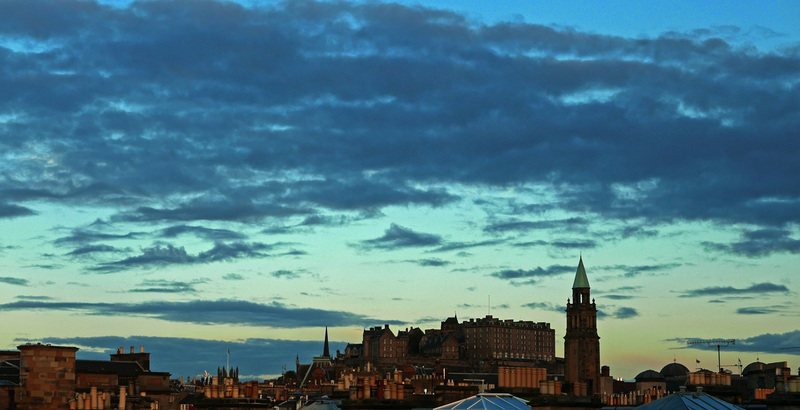 Another trip to the wonderful city of Edinburgh and as always I head straight to my number one place to dine , Castle Terrace with the extremely talented Chef Dominic Jack. It was very sad to see the restaurant losing their Michelin star in October 2015. To be perfectly honest I was fully expecting them to be awarded their second. 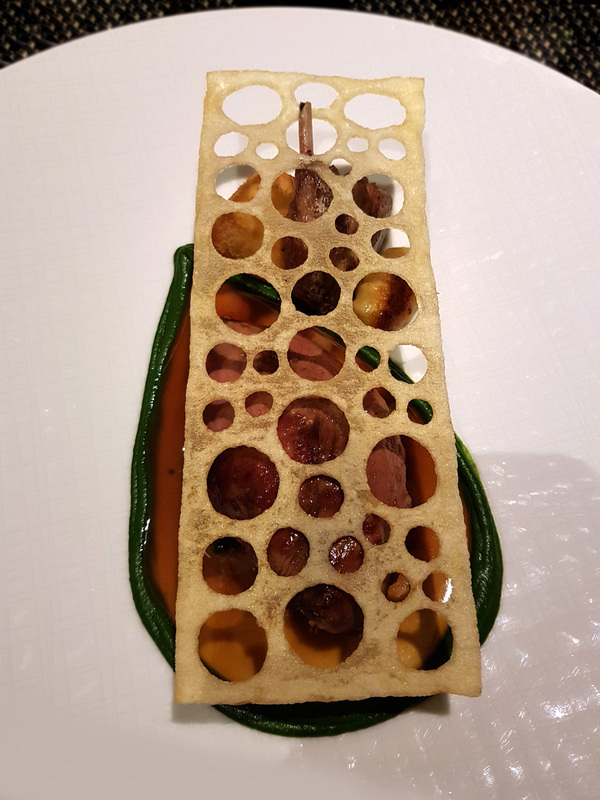 I`ve eaten in enough restaurants around the world to know in my heart that Castle Terrace is running at a 2 Michelin star level. 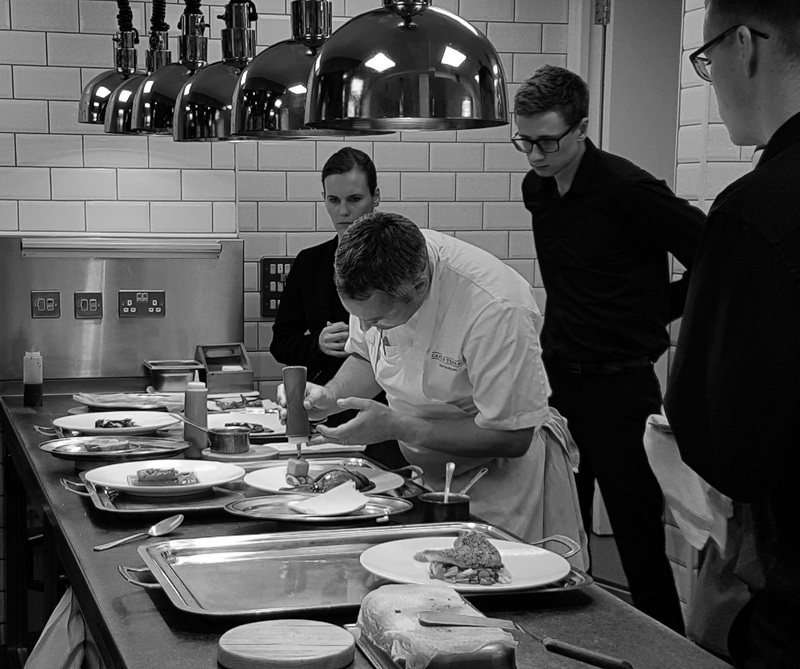 Goodness knows what these Michelin inspectors are looking for or even thinking and it was akin to a kick in the Gonads when last years results were announced. Anyways , not to dwell on the past so let`s keep positive and move onwards and upwards. A full Castle terrace refurb has taken place since my last visit. A Million pounds later and a new stunning restaurant has been born. New kitchens , New artwork and a whole different restaurant design had been created to elevate the business to a totally new level. On this visit we asked for Chefs surprise tasting menu. This showcased everything currently in season throughout the Scottish mainland and surrounding islands. At 14 courses this was a lot of food to get through but some of the courses were split so both myself and my good wife ended up with different dishes to try…and share. 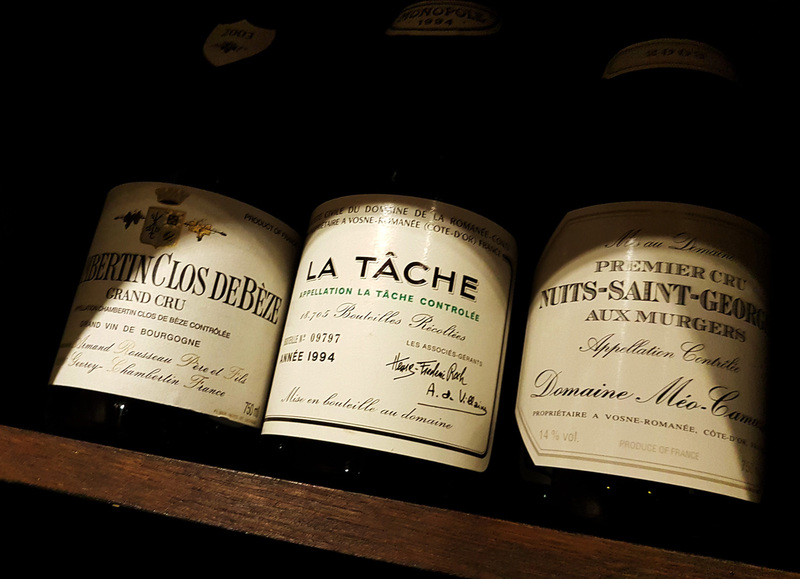 With such a wide ranging menu it made sense to try out Sommelier Joel Bastians wonderful selection of wines. Problem was that 14 wines , one to match each course would have ended up in an ambulance ride home instead of a taxi. Joel suggested we went for a “half wine flight” as a sensible option. 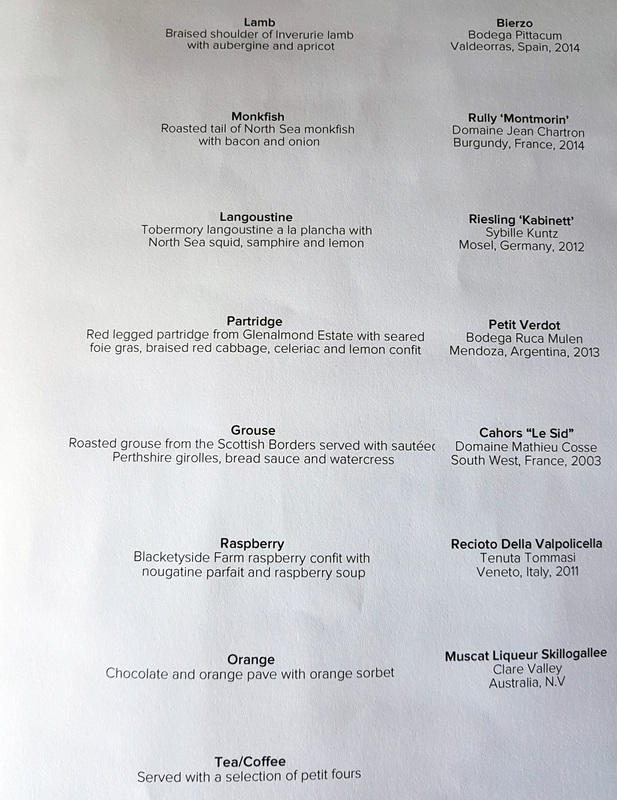 A small taster of each wine to accompany each course…..awesome idea. I was informed that “ half a Wine flight is certainly not a problem sir…..we can do anything here”. I`ve only ever encountered this in the London Ritz before so I think it`s a great idea and it also saves being totally `Blotto` at the end of the evening. The restaurant was totally full during our visit and I was informed that an early start and a late finish ensures that each table can normally turned twice in a night. 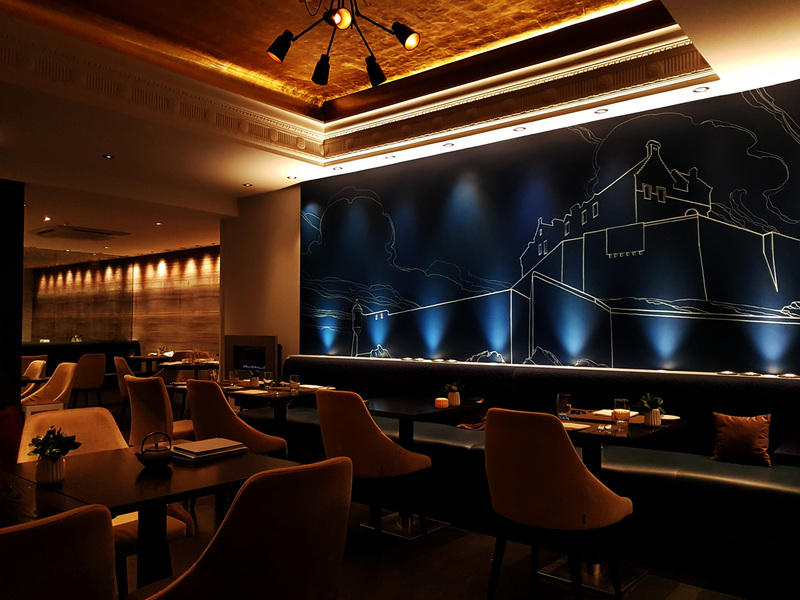 Anyone wanting to eat at Castle terrace needs to get booked in pretty early as reservations are full weeks in advance. 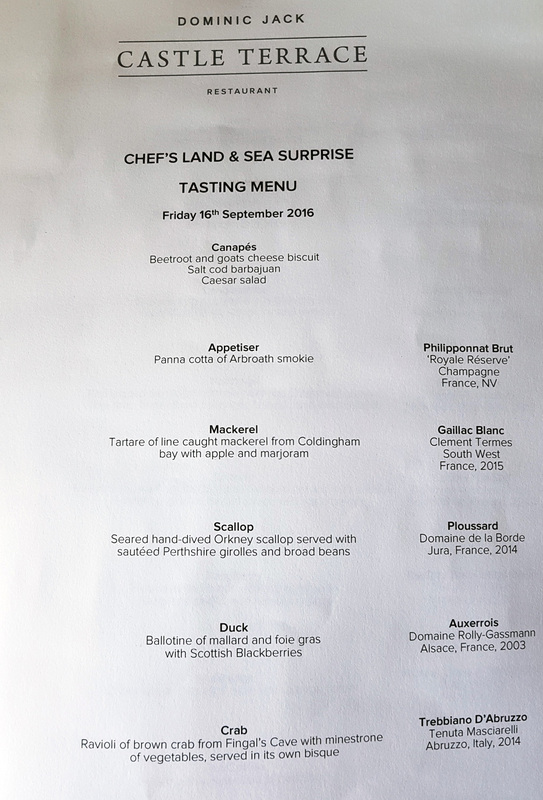 So here we go for Dominic Jacks Land and Sea Autumn Surprise tasting menu. I’ve already written in past posts about Dominic and his talents as a chef so I’ll recap very briefly. 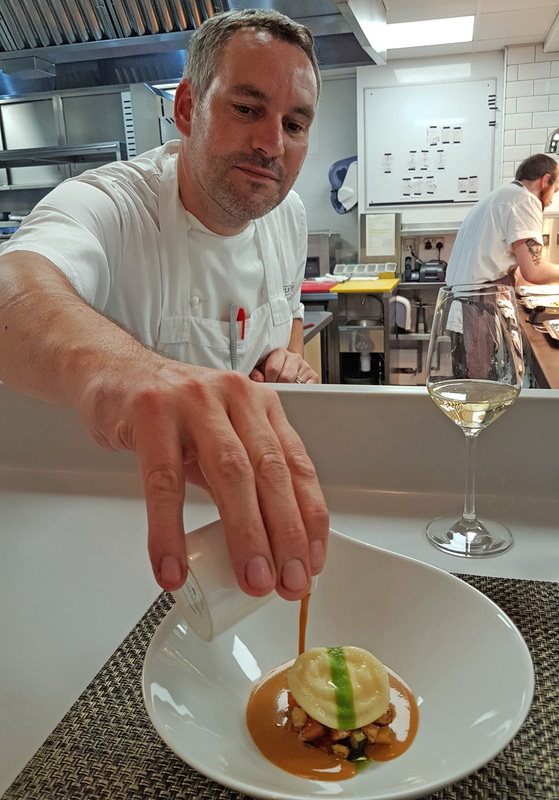 Chef Dominic is hugely talented having trained in the 3 star Michelin kitchens of Paris. 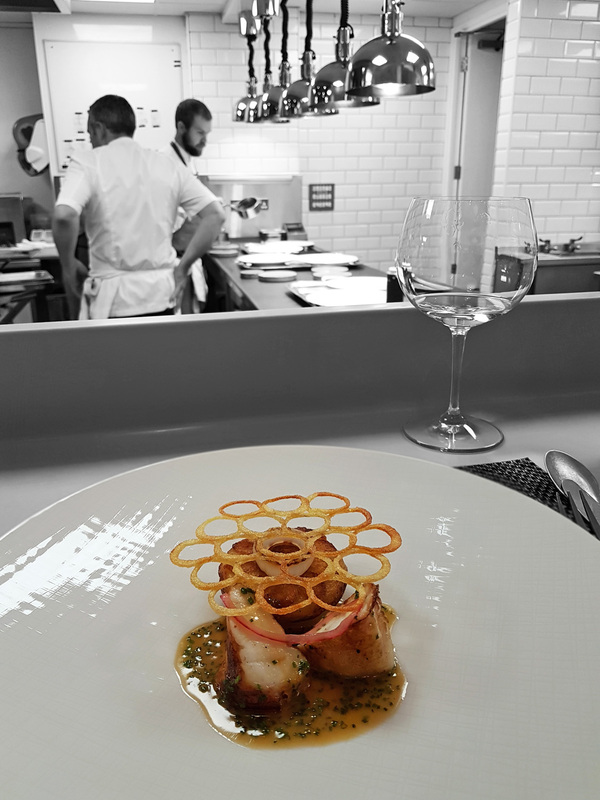 This comes through in Dominics cooking style and presentation…..classic old school with a modern twist , no gimmicks and an amazing amount of attention to detail. 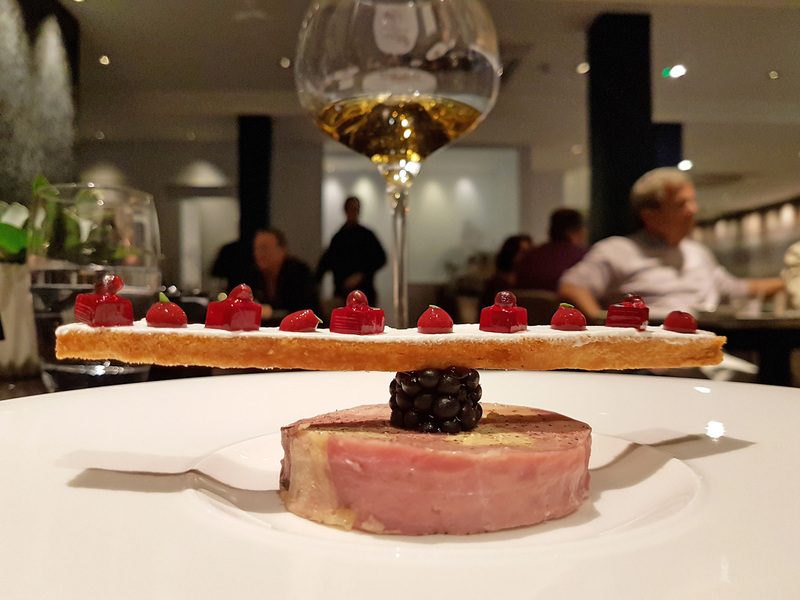 I`ve recently eaten in some of the very best restaurants in Paris and if I were given a blind tasting then I would honestly put Dominic Jacks food up there with best that Paris has to offer…..it really is that good. Seasonal produce , the very best in ingredients sourced from Scotlands best suppliers. 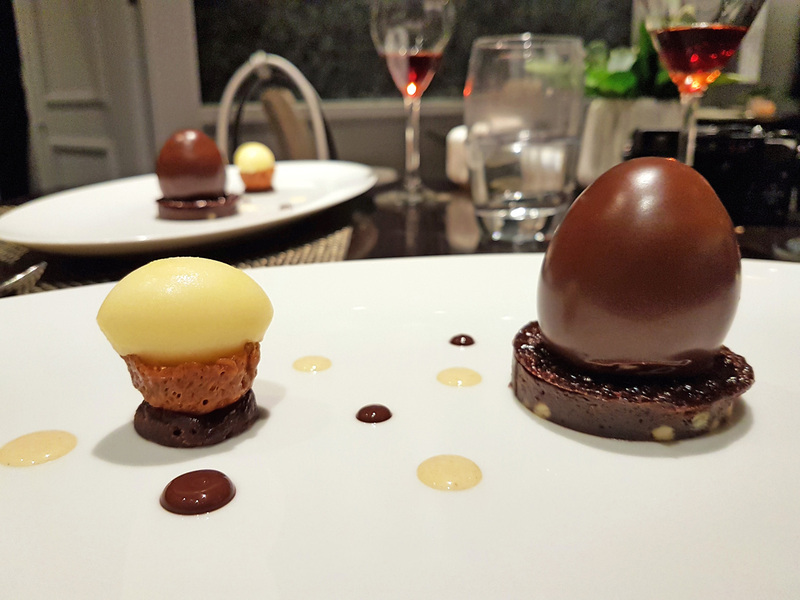 Cooked to perfection and beautifully presented as you can see from the photographs below……Go find out for yourself , you certainly won`t be disappointed. CANAPES – Beetroot and Goats Cheese Biscuit , Salt Cod Barbajuan , Liquid Caesar salad. 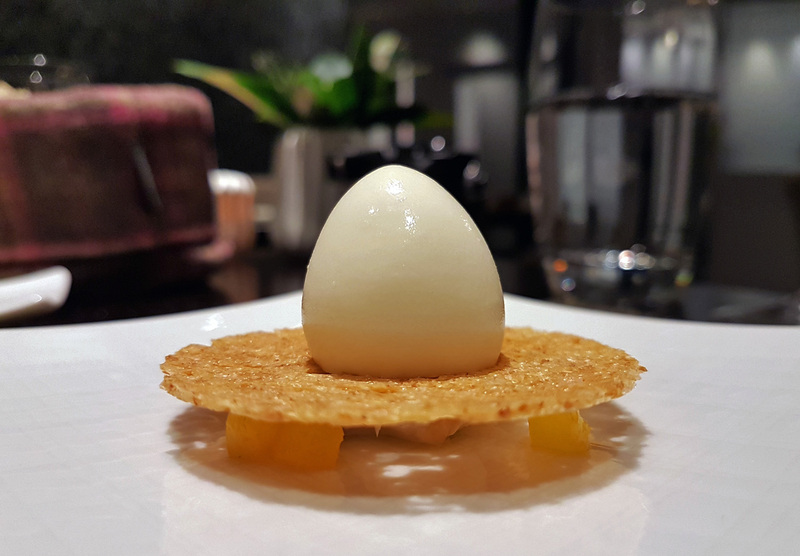 APPETISER – A delicate Panna Cotta of Arbroath Smokie containing a liquid Egg yolk of sweet Mango puree. 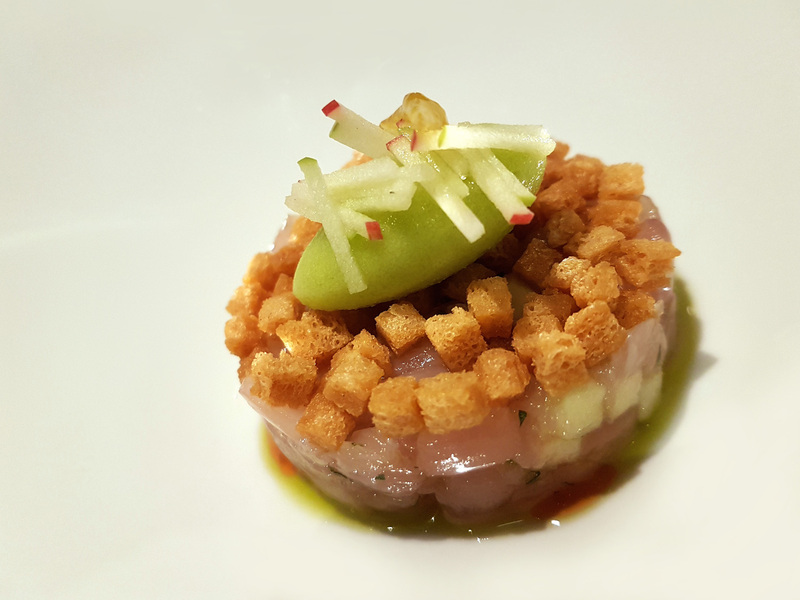 MACKEREL – Tartare of line caught Mackerel from Coldingham bay with Apple and Marjoram. 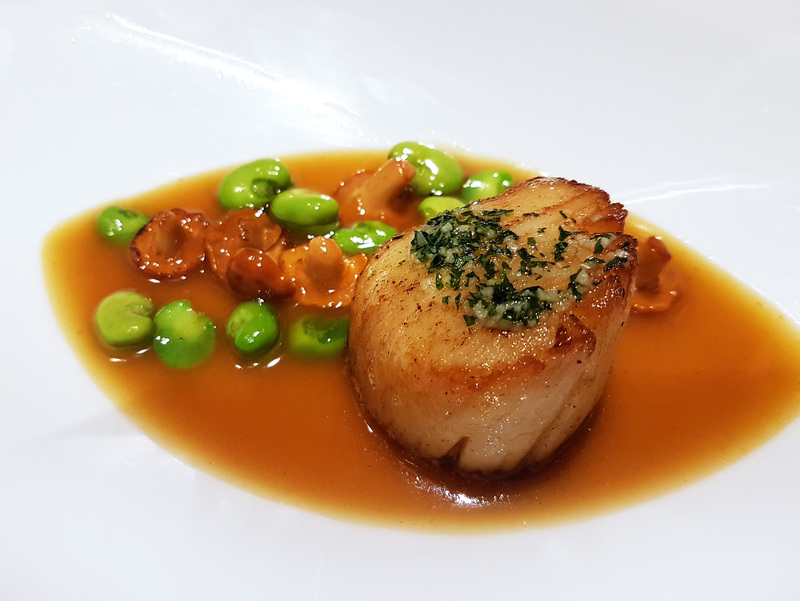 SCALLOP – Seared hand dived Scallop from Orkney with sautéed Perthshire Girolles and Broad Beans. One look at this dish will tell you how it tasted , everything was pure flavour. Wish we could get Scallops this size in Cumbria. 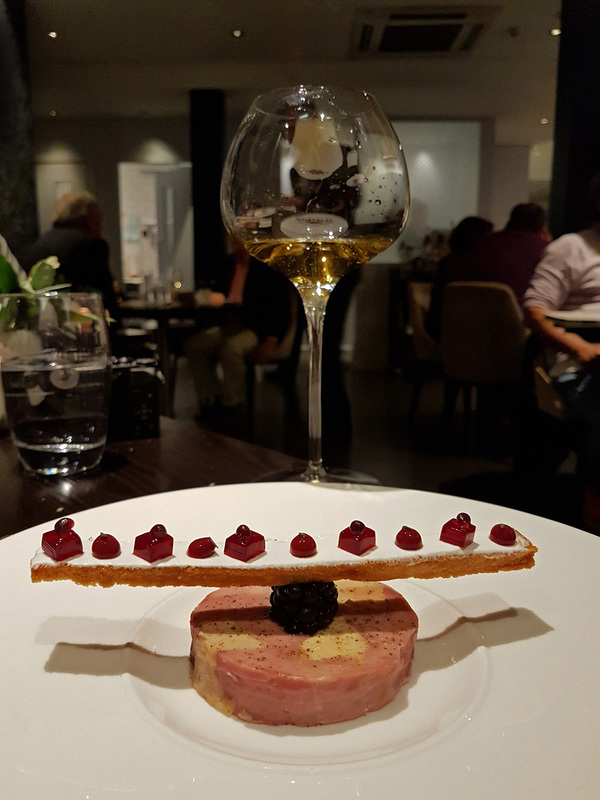 DUCK – Ballotine of wild Mallard and Foie Gras with Scottish Blackberries. 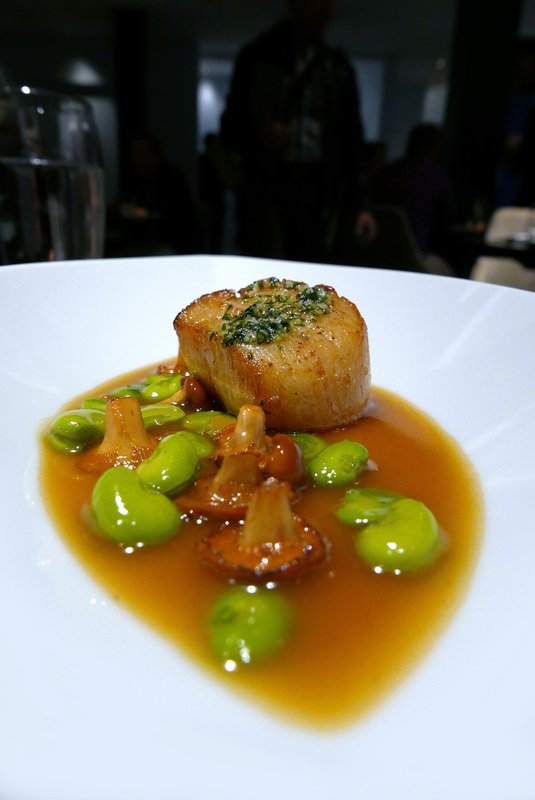 A delicate assembly of prime ingredients with an amazing attention to the finest detail. 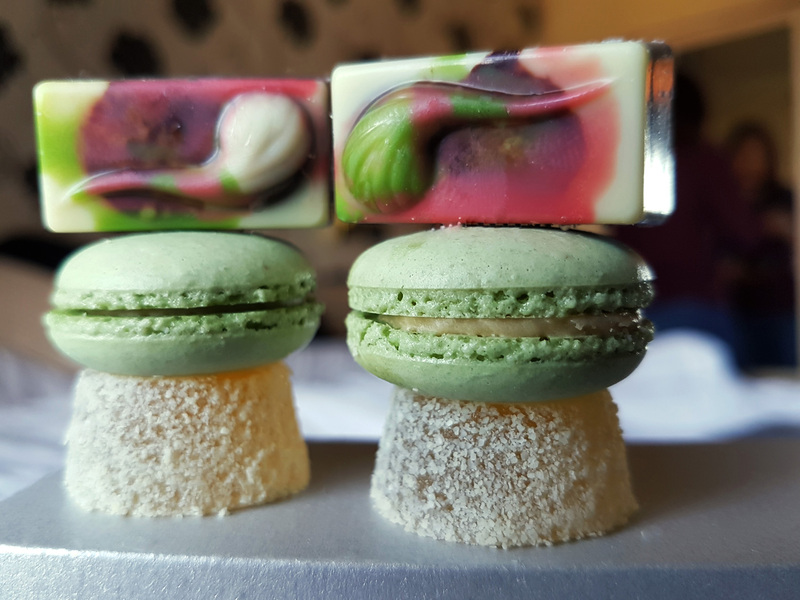 Even the tiniest cubes of tart blackberry jelly were topped with microscopic herb leaves. It was at this point where we were both invited downstairs to see the new kitchen. I thought it would be a quick hello and a look around but a total treat lay instore for us. 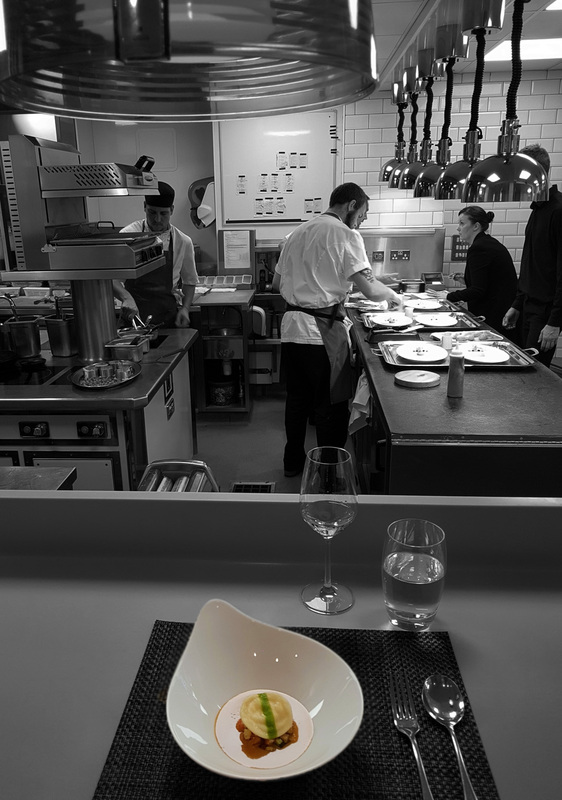 We were shown to Chefs table overlooking the pass. Wines were poured and it was here that we would savour another three courses , chat with Chef and watch the team working. 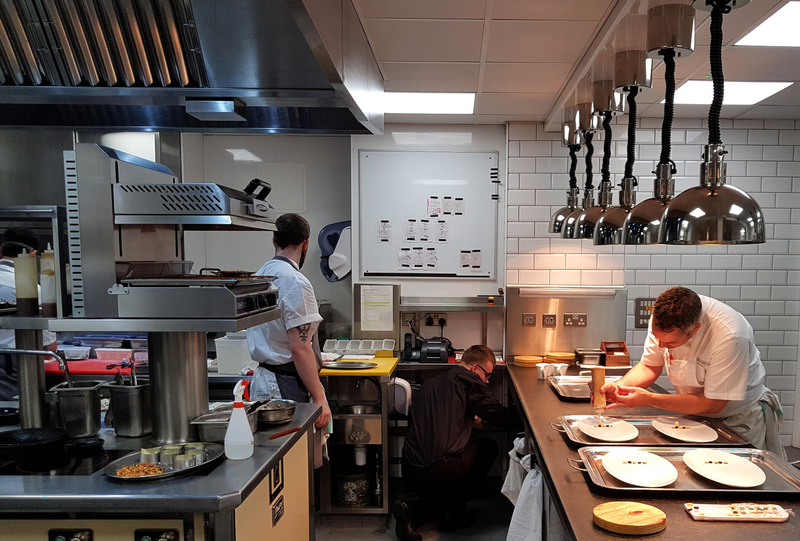 I have to admit , I’ve never seen coordination like this before , the whole team were totally switched on and working in total unison responding to Chef Dominics every command. We were then given a tour of the kitchens to meet the full team at their stations and a look at the amazing little wine cellar stocking some rather precariously balanced extremely expensive bottles of wine. It was lovely to see 2 huge stockpots and to hear that it was part of every evening for one of the chefs to get the stocks on the simmer overnight. Veal and Crab stocks were going on during our visit…Classic techniques and skills that will hopefully never die away. 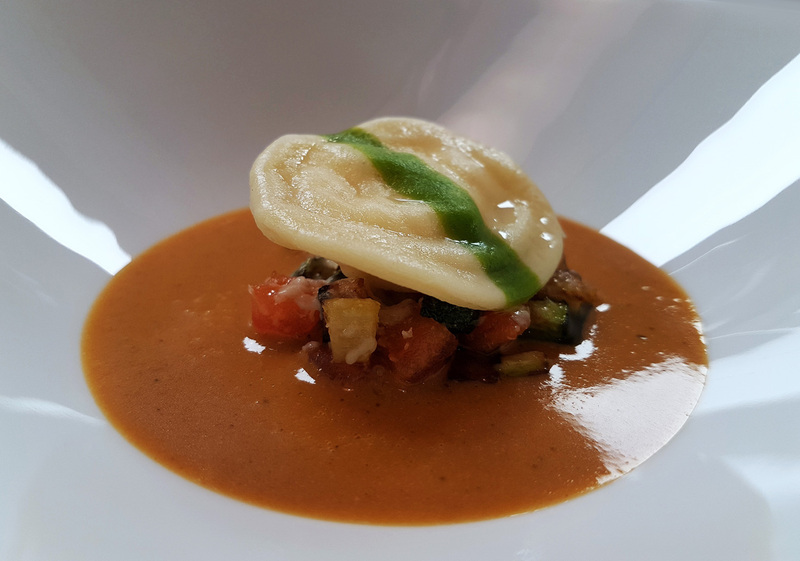 CRAB – Ravioli of Brown Crab from Fingals cave with Minestrone of vegetables, served in its own Bisque. 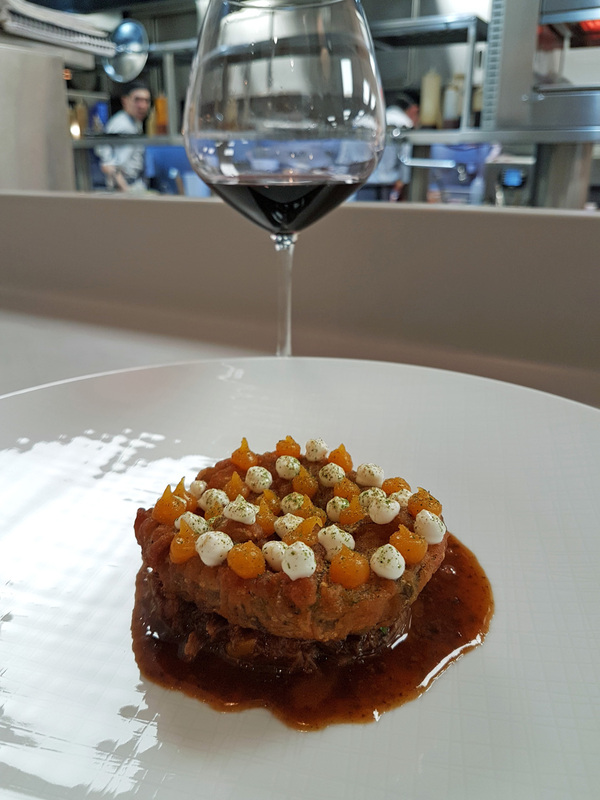 LAMB – Braised shoulder of Inverurie Lamb with Aubergine and Apricot. Ahhhhh , the main course has arrived yes ? Ermmmm….sorry , just another one to try out. MONKFISH – Roasted tail of North sea Monkfish with Bacon and Onion. Chef was having one of his crazy moments , he knew how passionate I was about my food and he was so keen to keep me smiling…..I loved every second. 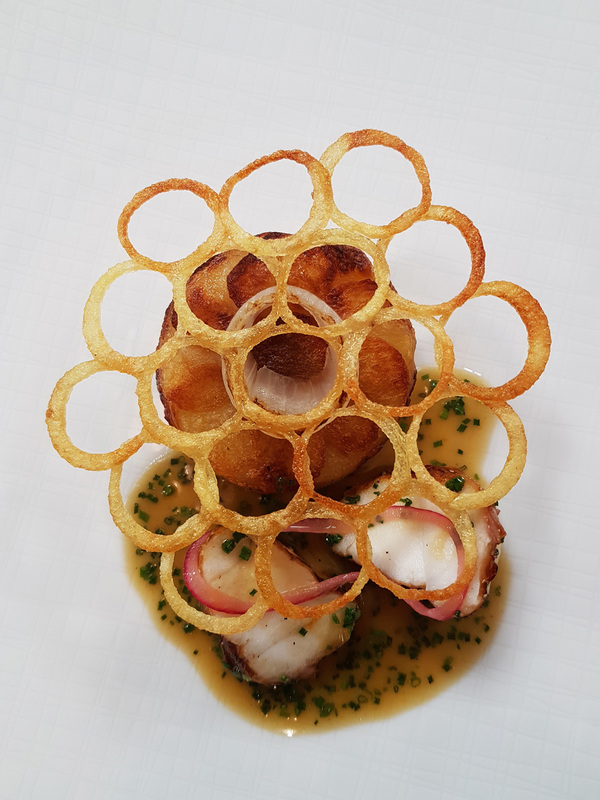 Take a look at this stunning presentation in the crown of Potato rings. 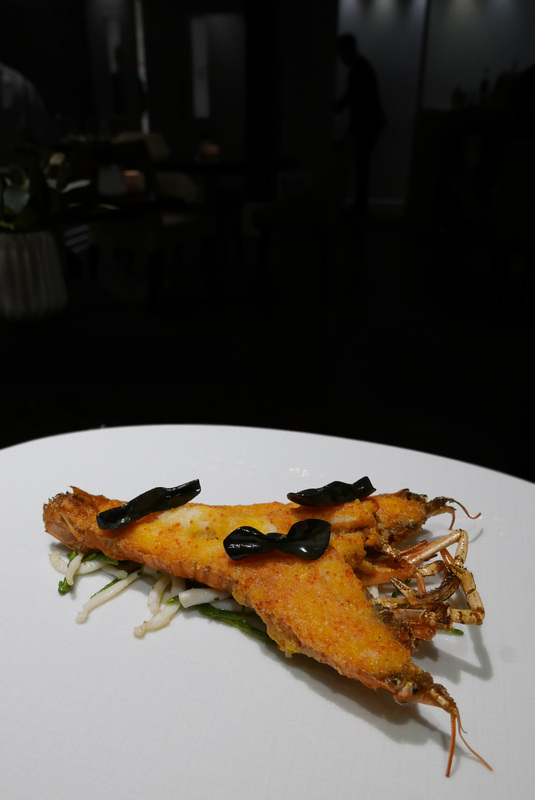 LANGOUSTINE – Tobermory Langoustine cooked `a la plancha` with North sea Squid, Samphire and Lemon. Back upstairs and main course time……Surely it had to be ? Almost…..one more to go. This creation was most probably the star of the show , full of beautiful creamy seafood with a crumb topping toasted under a grill…..WOW. 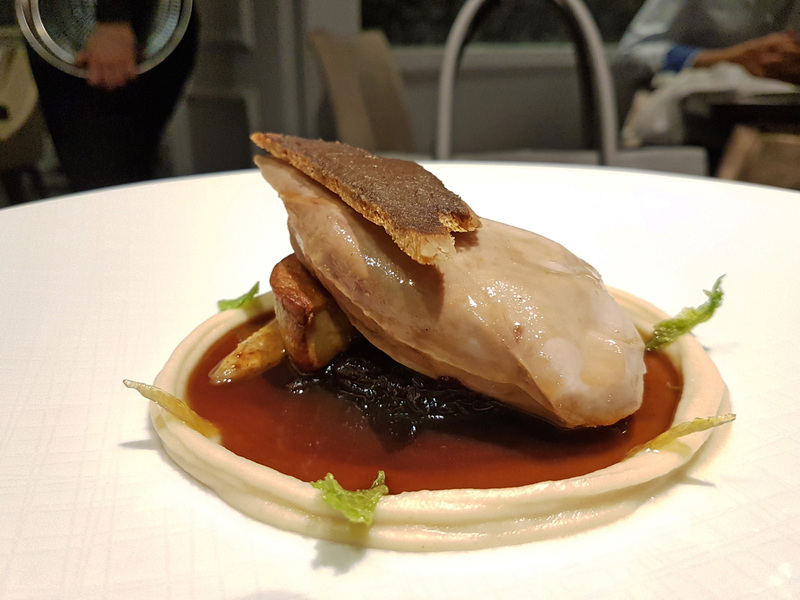 PARTRIDGE – Red legged Partridge from Glenalmond estate with seared Foie gras , braised Red Cabbage , Celeriac and Lemon confit. Finally main course arrived. I had to request a split main course at this point as I was ready to explode. My wife got the lighter Partridge whilst I got stuck into the Grouse. 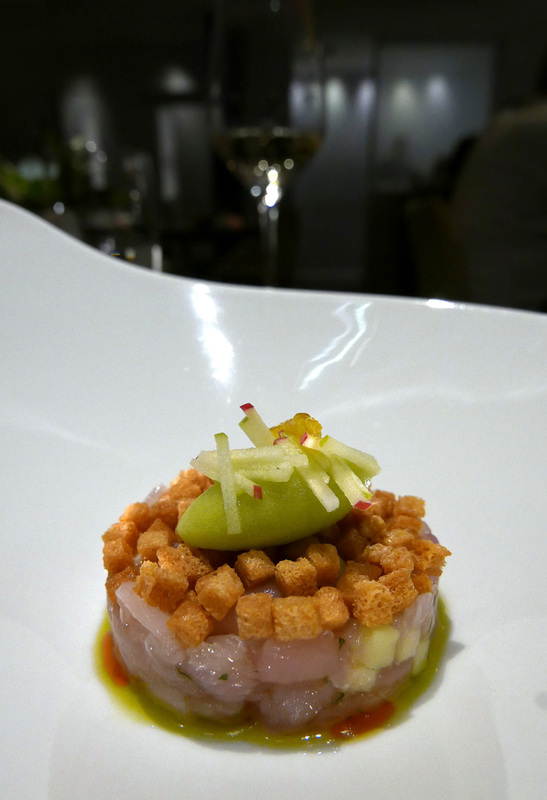 The presentation on both dishes was fantastic , classic Parisian and top shelf robust flavours. I ended up eating most of my wifes Partridge which was definitely my favourite of the two. Partridge ,Foie gras , sweet red cabbage and Lemon confit…..what a stunning combination when eaten together. GROUSE – Roasted Grouse from the Scottish Borders served with Watercress , sautéed Perthshire Girolles , and Bread sauce. RASPBERRY – Blacketyside farm Raspberry confit with Nougatine Parfait and Raspberry soup. 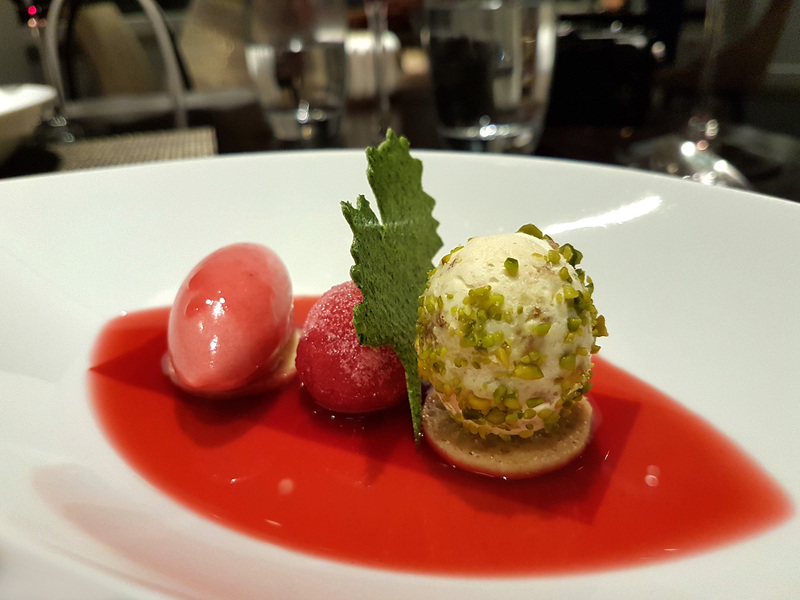 By the time desserts appeared we were almost waving the White flag but seeing as though the puds are my favourite I suddenly got a second wind and was raring to go. 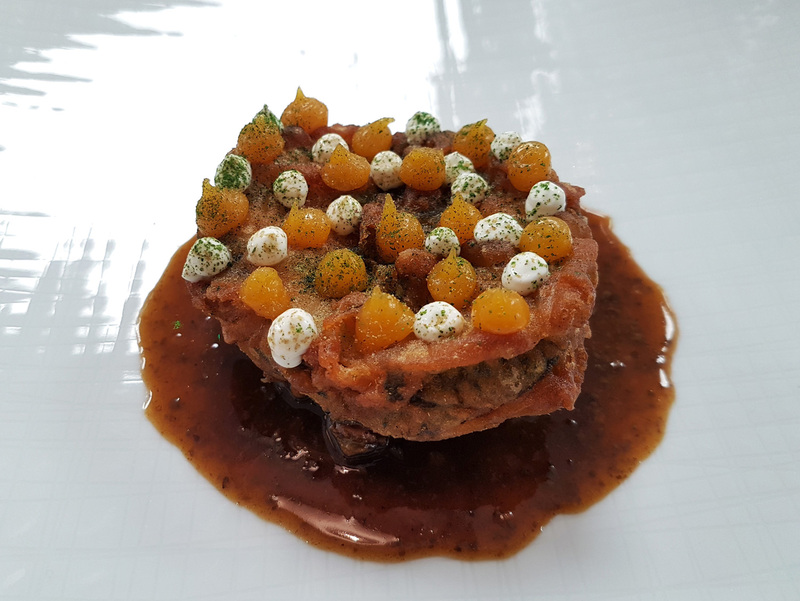 ORANGE – Chocolate and Orange pave with Orange sorbet. 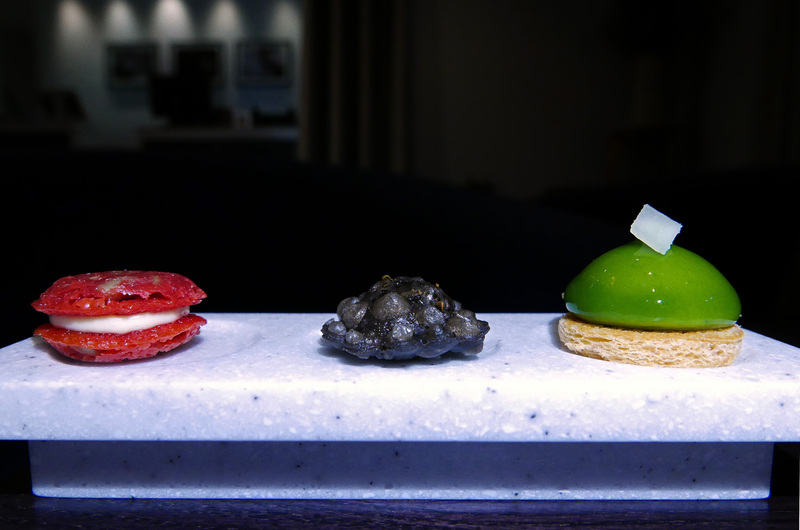 SELECTION OF PETITS FOURS – Truffle , Macaron and Pate de fruits. Full to the limit we took these little treats back to the hotel to eat for Breakfast. 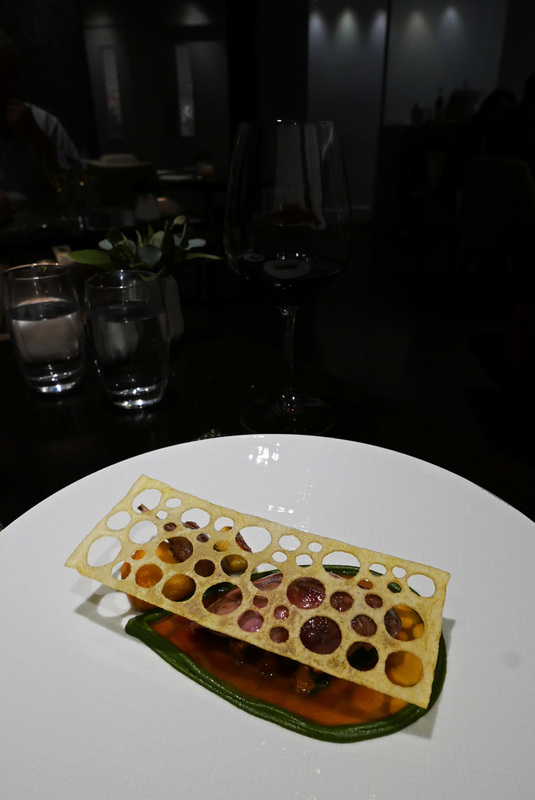 Previous Post Michelin Star for the Samling. Next Post Linthwaite Hotel , Big plans and big smiles.